The World Fashion centre (WFC) can be reached easily and quickly by car as well as by public transport. The WFC is located alongside the A10 ring road around Amsterdam. After taking exit S106, simply follow the road signs to the World Fashion Centre. Our car park has 950 parking spaces. Take the train to the Lelylaan NS (Dutch national railway) railway station. From there, you can walk to the WFC in five minutes. There are excellent tram links to the centre of Amsterdam. Tram lines 1, 2 and 17 have stops located only a few minutes by foot from the WFC. Metro ring line 50, running from Isolatorweg to Gein, stops at two stations within walking distance, namely at the Heemstedestraat and Lelylaan stations. 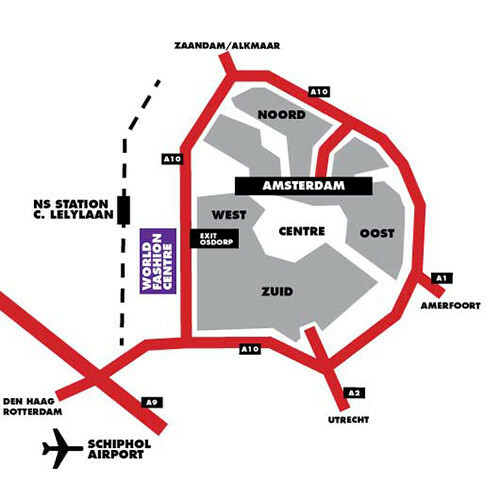 Schiphol Airport can be reached in less than 15 minutes by train or car.